Kitchen blenders are ideal for mixing liquid foods or those that incorporate a lot of liquid, such as purees especially pureed baby foods, soups, milk shakes, frozen drinks, and smoothies. Those that have the function for crushing ice are even more useful, especially since if directions are properly followed ice can be crushed at any speed by many blenders. Some of the settings that are useful on blenders are the puree setting, pulse setting, blend setting and are really different speeds of the blender. These speeds are generally referred to as stir, mix, liquefy, puree and chop, with the added ability to pulse the blender’s contents for mixing at short intervals. These great kitchen tools generally come in 3 or 5 speed models. 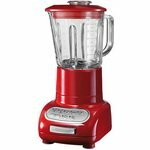 When looking for blenders to purchase some of the features that you should look for are tapered or serrated blades in asymmetrical positions, at least a 6 ½ cup capacity, a sturdy , tapered polycarbonate or glass jar, one that comes apart from its base easily for cleaning and is dishwasher safe, and different settings for different food preparation tasks. The lid should have a removable ingredient cap that doubles as a measuring cup. The blender should also have a powerful motor, because improper usage of the blender has in the past resulted in burned out motors, especially when trying to blend foods without an appropriate amount of liquid added, adding too much to the blender or crushing ice, so it is important to buy a good quality blender with a powerful motor and only use it for what it is designed to be used for.